Volleying is one of the most difficult skills to master. It’s also one of the most important if you want to become as competitive as possible. Why? Because it disrupts the rhythm of the game thereby throwing your opponent’s strategy off balance. When you volley, you are taking the ball early – by definition, before the ball has taken a bounce. This means that not only has your opponent less time to recover from making their last shot and getting into position to react to the next, but you are less likely to be playing from the back of the court, which otherwise would put him or her in the driving seat for the rally. As you become more adept at making the shot, you will be able to add a greater degree of variety to it, which means you will become less predictable and, therefore, harder for your opponent to handle. However, initially aim to get plenty of depth into your volleys so that they are landing at the back of the court. This won’t mean you’ll necessary be producing a great number of kill shots, and admittedly you will be more predictable, but you will be placing your opponent in a part of the court he or she doesn’t want to be. They will be having to work a lot harder around the court, too, placing you at an advantage as the match reaches a climax and fatigue becomes a big factor in deciding who wins. From the middle of the court, whichever basic volley you are attempting – forehand or backhand – decide early that you are going to attempt it so that you have as much time as possible to get both your feet and hands in the right position to execute it effectively. For the forehand, use a short backswing with a firm wrist so that you can punch through the ball. Racket head and ball should meet at shoulder height and level with the forward shoulder. As far as your feet are concerned, keep them steady and step across on the front foot as your body shapes into the execution of the shot. Remember that your feet provide the foundations for the shot, and the stronger those foundations are, the more control you will have when executing it. As far as the backhand is concerned, the same solid approach to footwork should be adhered to. Again, you’ll need a solid wrist in order to punch through the ball but unlike the forehand, racket head and ball should be meeting ahead of the forward shoulder. If you are aiming to hit the ball cross-court, then you should aim to hit the ball even further in front of the forward shoulder.If you find yourself volleying from the back of the court, the same rules apply. You’ll find a short backswing particularly useful as it is likely there won’t be much space to play with. 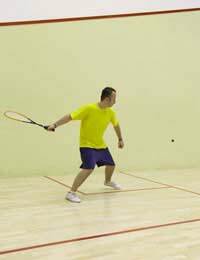 As well as the mechanics of making the shot, volleying is also about confidence: both in the choice of shot and your ability to pull it off. The more you believe in your own ability, the more likely it is you will achieve a successful outcome. Correspondingly, the less you believe, the more likely this nervousness will translate into poor technique and a poor outcome. So think positive and get practising.